Page-Padilla Time Machine - . I am just seeing this photograph for the first time and I'm in love with it. The photo is of my paternal grandparents, Nelson and Sophie. 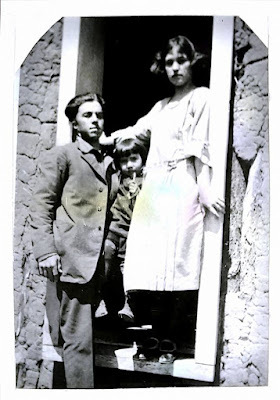 We think it was around 1924, when they were first married. My grandmother was 17. We're guessing the child was a cousin. It was taken in their hometown, Pueta de Luna, New Mexico. They spoke only Spanish until they moved to Texas in the 1940s. These two went on to have 8 children and 27 grandchildren. (28? I always lose count of my cousins.) I can't count the great-grandchildren. Beautiful kids they were themselves.